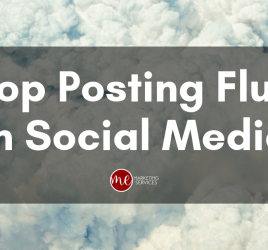 Recently I was scrolling through Facebook and I saw a post that floored me – it was a post about a social media statistic that said the majority of small businesses base their social media success on the number of views a post gets. So naturally, I want to see the source. 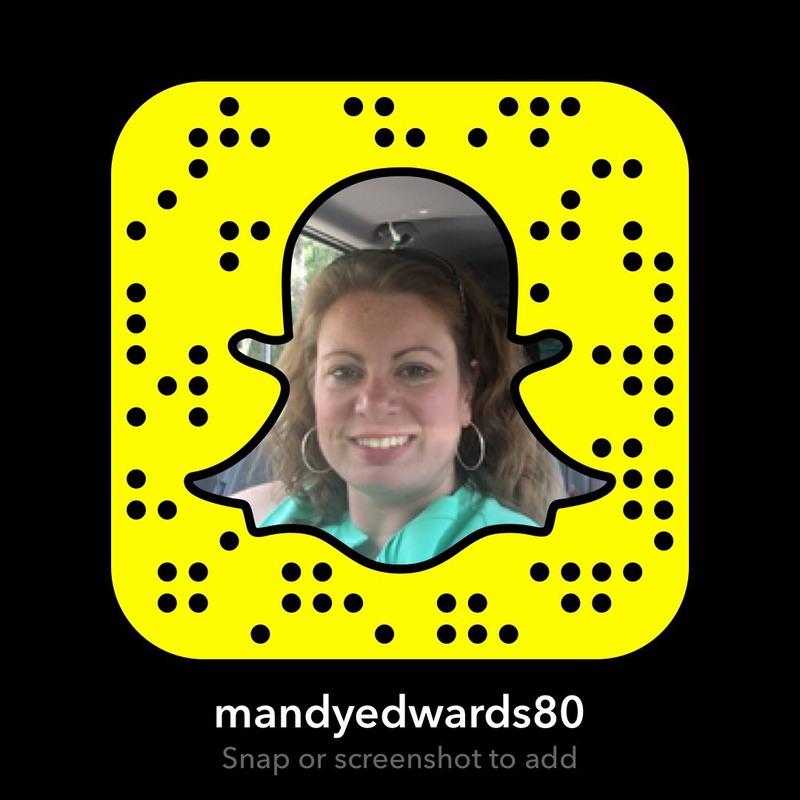 Instead of finding an article that enraged me because I disagreed with that stat (which there is a post forthcoming about that particular statistic), I found an article that totally backed up why small businesses need to be using social media. A company called Clutch did a survey of 352 small businesses in January 2016. 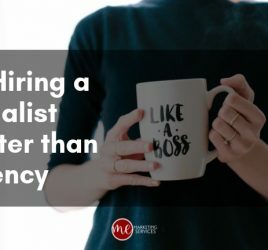 The majority of these businesses produced less than $1 million/year in revenue and have less than 10 employees, which classifies them as a United States Small Business. 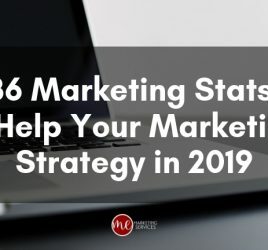 Their findings were a little surprising to me because I really thought businesses had come further into the age of social media marketing than it had. Maybe I’m just spoiled where I’m located because everyone here has gotten in the social media game. However, if your business hasn’t, you need to. Now. Because if you’re not, your competitor surely is. 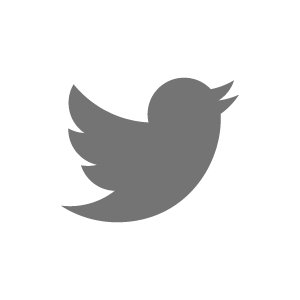 The case for why your business needs to be using social media. Reason 1: It’s not as hard as you think. Thanks to many programs out there (i.e. 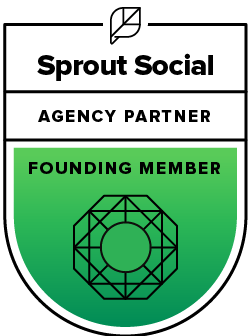 Sprout Social, Hootsuite, Buffer), managing your business’ social media doesn’t take a lot of time. You can schedule your business’ posts, respond to questions and much more from one dashboard on your computer or mobile device. Plus they all provide analytics so you can track your efforts as well. If you know your business needs to be on social media and do not want to handle it yourself, you can always outsource this as well. According to Clutch’s survey, in 2016 alone, an additional 18 percent of small businesses plan to engage in digital marketing activities. And, by 2017 or later 70 percent plan to implement a digital marketing strategy. Reason #2: Being on social media opens your business’ doors beyond your physical location. Once you go online, anyone, anywhere in the world can find you. You can become global. I have seen local mom and pop retail stores expand their customer base across the country and see increased sales from going online and selling on Facebook and Instagram. Some have even seen sales come in from Canada and the UK. 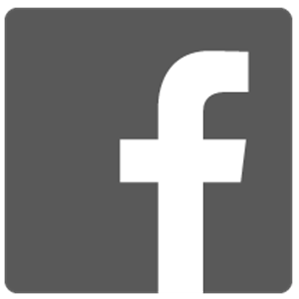 Because of social media, you can use targeted posts and ads to reach people in certain geographic location and people with certain interests, so you know your posts and ads are being seen by those who are most likely to purchase your goods or services. I do not know if a single business who did not want to grow. Reason #3: Social media is a must if you want to have a successful digital marketing plan. 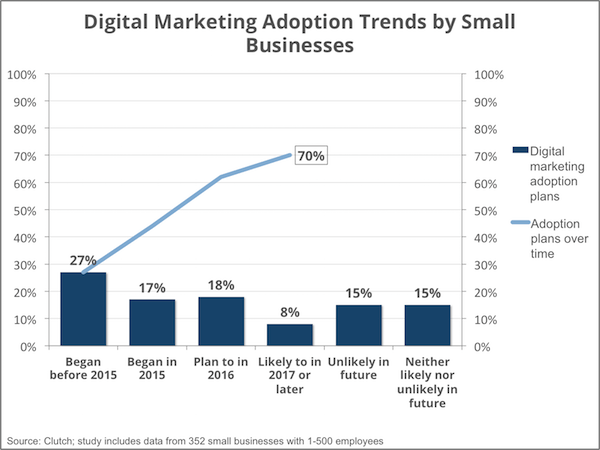 According to the Clutch survey, “Small businesses agree that digital marketing is imperative to business success, and they have faith in their ability to execute an effective strategy. 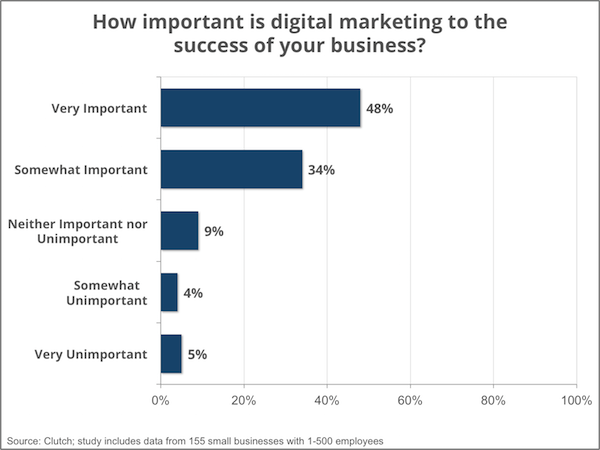 Nearly all small businesses, 82 percent, claim that digital marketing is important to their company’s success.And, more than half of this sample, 48 percent, say digital marketing is very important, as opposed to somewhat important. 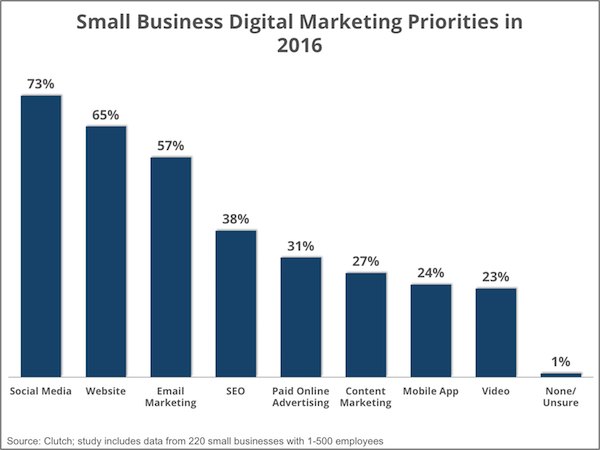 The survey also shows that small businesses choose social media as their digital marketing channel of choice for 2016. 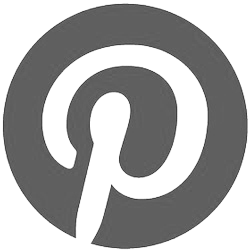 Specifically, 73 percent of small businesses currently use or plan to use social media in 2016. As you can see in the graph above, small businesses are putting more into social media and their websites this year than SEO, paid online advertising and video. The reasons may be simple, but it’s not complicated – small businesses need to take advantage of social media and use it to maximize the exposure of their business. As Joshua Dirks said in the article about the survey, “What social has done for the Web is what color did for TV.” Small businesses that don’t take advantage of this miss the chance to engage with their target audiences/potential client and customers and create a brand for themselves online. Is your business ready to take the plunge?